For anyone who has ever looked up at the stars and wondered what it all means, Isaac Asimov's Guide to Earth and Space is indispensable. Isaac Asimov's gift for popular and entertaining exposition has never been better deployed, with his succinct answers to the most intriguing questions about planets, stars, and galaxies. What are quasars? How was the Earth formed? Puzzled by pulsars? Perplexed by the Big Bang? Bewildered by black holes? Asimov has answers everyone can understand and enjoy. From the late 1940's through the 1950's, in a world where space travel and nuclear annihilation were no longer merely the stuff of fantasy, science fiction began to achieve a new popularity. And, the work of noted genre writers began to be adapted in movies and radio programs. Based (however implausibly) on science, these radio broadcasts reflected the depths of the nation's fears, and the boundlessness of its imagination. At last I hear the voice of uncle Issac! 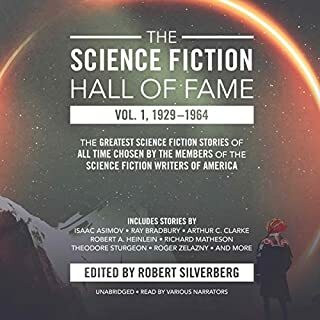 This selection of some of Asimov's most enduring and unforgettable stories is read by the author himself. These vintage tales encompass the full range of Asimov's versatility, while displaying his puckish sense of humor. 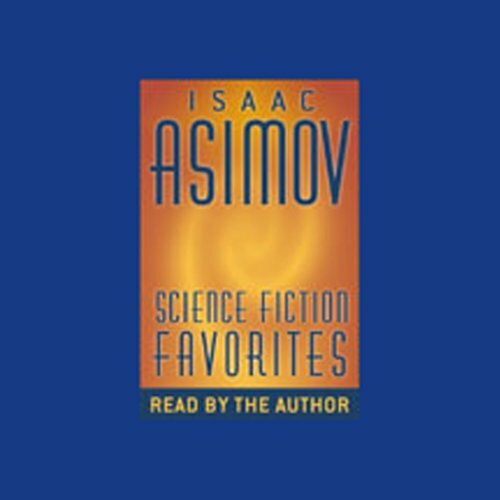 At first, I thought Asimov's voice was a horrible fit for an audiobook. "Now I know why he's an author, not an actor!" However, as I kept listening, the more personal and real connection he had to his work came through, and the less-than-stellar acting was overshadowed by the warmth and feeling of getting to know a bit of Asimov. By the end of the last story, "The Ugliest Little Boy" (if I remember the title correctly), both the listener and Asimov are completely drawn into the narrative, and, frankly, it was a tear-jerker. I was glad I had stopped for gas when I hit the end of it, because it would have been hard to pay attention to the road and the emotion of the story and the narration. Even if you're not a science fiction afficionado, these stories transcend genre boundaries and make great listening. I don't understand some peoples objections to Mr Asimov's reading. He actually does a great job! And what's better than hearing the stories read the way they were intended to be. People will be certainly reading Asimov's stories in print hundreds of years from now. His Foundation books are perhaps the best science fiction ever written. When I chose this title I was hoping only for a few gems and expected to hear the stories narrated by a professional actor. To actually hear Asimov's voice telling his own stories was, for me, wonderful. Sure he sounds a little funny - like the way he pronounces robot as "row-bit" - but to me there was something fantastic about hearing his inflections and his comments as he read his own stories. Some of the stories were wonderful and others were merely clever. All were worth listening to. Compared to the other audio books I have listened, this one is one of the very best. Of course, Asimov did not sound anything like I expected, but he did well in the narration and his comments before and after really helped me understand why he wrote a story in the first place. I will probably never listen a second time to most of the books that I download from Audible, but that will not be the faith of this one. 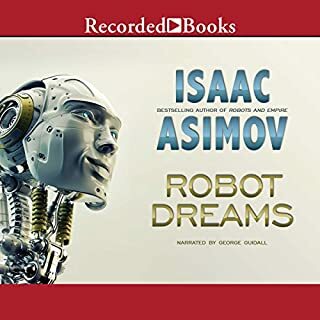 If you are a fan of Asimov and you have never heard is voice, than this is a must. I have been a fan for decades, but never heard him speak. I was expecting an old man voice. Maybe like a college professor? I knew he was Jewish, but this was interesting. He sounds like the caricature of Brooklynn Jews you hear on TV and he sounds young. He also talks likes he writes, which I always suspected. Asimov has the knack of writing like he is a friend of yours sitting across from you talking about the weather. All the stories are good, none are bad. The Ugly Little Boy was the greatest. I have read this story several times and read the book he wrote with Robert Silverberg and it is still a tear jerker. Asimov even cried when he read it. Satisfaction Guaranteed was my next favorite. This is a story which has Dr. Calvin in it and she is trying to perfect robots. Asimov explains before each story, why he wrote it and says a few words after each story about the story. This adds a lot of charm to the listening. One interesting thing he said, was that if he had to take a college class on his writings, that he would probably flunk. When they go to analyzing his work, he would not understand all the deep underlining meanings he was suppose to have in his writings. If your already a fan, this is a must or this is a good place to start, if you don't know him.. 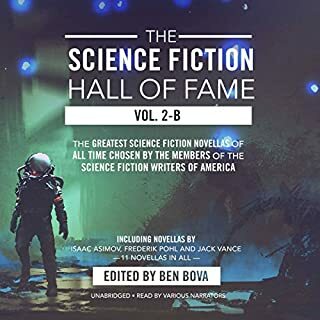 This collection features several of Isaac Asimov's best-loved short stories along with some additional commentary by the author. The reading is crisp and sound quality is excellent. The high points of the collection have to be "Spell My Name With An S" and "The Ugly Little Boy"; the stories clearly illustrate the author's humour and sensitivity. In particular, the conclusion of "The Ugly Little Boy" is unique in Science Fiction by being a commentary on Humanity and Motherhood; you can clearly hear the author moved to tears while reading it. Great text, great audio quality, read by the author himself. This is one of the most prolific writers in the history of mankind reading a personal selection of his own texts! I'm kind of a fan of dr. Isaac Asimov. When I first saw this book on audible it was an instant buy. As soon as I begin listening to it, I had goosebumps all over. By the end of the last story I had a tear forming on my eye, not only because the last story is beautifully sad, but because it was the end of the book. Well, if you like science, if you like stories, and you appreciate good well writen stuff: this is the way to go. If you don't know Asimov: you are missing a huge chunk of good literature, you should try and catch on with his books as soon as possible. 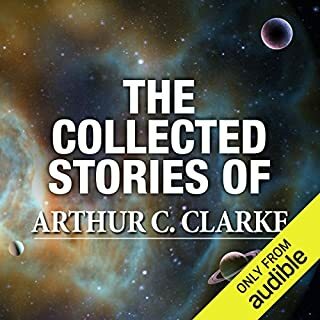 Try out "THE LAST QUESTION" - read it, be in complete awe, and then come and buy this audiobook and rush to chapter 9. Now- I wonder what can I get here that will get as thrilled as this audiobook did! As said in the title, the stories in this book are top notch, but the author's voice actually takes AWAY from the listening experience. He has a very nasally voice and I think the text would have been much better treated had they hired an actual actor to read the content. Apart from that, it is very hard to tell where one story starts and the next one begins, as there is no announcement or pause to let you know that any of the stories have ended. What did you love best about Science Fiction Favorites? What other book might you compare Science Fiction Favorites to and why? Ray Bradbury's "Fantastic tales of Ray Bradbury" Here to the man and his coments about his wrightings. What does Isaac Asimov bring to the story that you wouldn’t experience if you just read the book? the feal for the author as a person. adding the man and the story gives a better feeling for the hole. A good collection of stories all of which are exactly what you would hope for. My one and only gripe is that this is too short! I wanted more, I found Asimov was a good Narrator, personally I did not have an issue with his style at all. I challenge any fan of Asimov not to enjoy a story being read by Asimov himself. Also challenge you to do a good impersanation of an old fashioned robot without sounding a bit funny! Little anecdotes from the author between each chapter added to the pleasure of this listen. 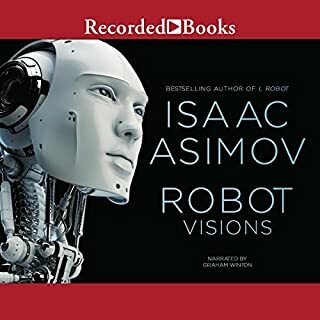 Excuse my rather extreme reaction but being an avid audiobook fan and listener in addition to being a huge isaac asimov fan this audiobook is a huge letdown- the narration by isaac asimov was so poor that i couldnt get on with listening to the audibook..especially his unbearable imitation of a robotic voice. Its the worst audiobook i have ever heard.. i will congratulate anyone who can bear to listen more than 30 mins of this garbage. Asimov was best known as a science fiction writer. But, of course, his intellect went far beyond that. 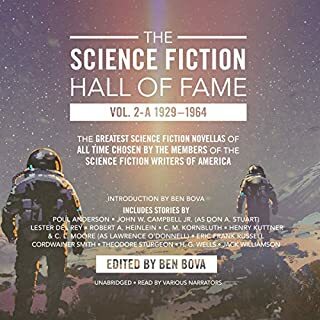 Here, however, is a collection of short stories demonstrating the power that the Sci-Fi Genre has in the hands of someone at the top of his form. With ideas that stay with you long after the story, Asimov creates Characters you can't help but care for. Think how rare it would be to hear a recording of H.G. Wells read his stories, then think again before passing up the opportunity to download this marvellous recording! Isaac Asimov has a voice which, to put it kindly, takes some getting used to. But it's worth getting used to the voice to listen to this selection of stories that he personally chose as his own favourites. And who better to tell them than the author himself? As well as reading the stories, he comments on all of them, giving his own perspective on how he came to write them -- or sometimes looking back with amused hindsight at how the advance of real technology made his imaginings seem quaint. You end up feeling as though you're having a chat with a friend. The stories (and occasional poems) cover the whole range of Asimov's writings, some witty, others serious, one or two quite moving. The last tale, 'The Ugly Little Boy', had the author himself choking back tears while he read it -- and I defy any listener not to join him with at least a sniffle or two.